New restaurants and retailers will open on a staggered schedule now through 2013 at Emory Point, the new mixed-use development near campus. Photo by Erica Ervin. Gazing out from within the Jos. A. Bank store open at the new Emory Point complex, store manager Schon Cotton finds it easy to believe the sprawling residential-retail development is ready for business. Jos. A. Banks is now open. Photo by Erica Ervin. Through the windows, she sees signs of completion: new landscaping, freshly-planted flowers dancing in the breeze, even festive holiday garland wound about streetlights that line recently installed walkways. But perspective, she realizes, is everything. Seen from Clifton Road, the first phase of the mixed-use development appears to be very much a work in progress — beyond the banners advertising future tenants, construction crews are still busily readying restaurants and interior retail spaces in this development that sits across from the Centers for Disease Control. Which view to believe? Actually, both are accurate, according to Jason Frost, vice president of Cousins Property, Inc., which is developing the site in partnership with Gables Residential and Emory. Although work does actively continue on the complex, restaurants and retailers will be opening in a staggered schedule from now through next spring, Frost reports. In fact, the bulk of lessees are scheduled to open within the next two months, he adds. Though they may not be directly visible from Clifton Road, four clothing retailers — Jos. A. Bank, Loft, Fab'rik and Lizard Thicket — and dry cleaner Carriage Cleaners have already opened for business at Emory Point. "We were the first to open — at the time, there wasn't even a street back here yet," Cotton recalls, smiling. "Since then, a lot of our business has come from (Emory Point) residents and students looking for something to wear for job interviews." The clothing retailers are located in the second "block" of buildings, just behind the structures that front Clifton Road. And with the help of some savvy marketing, customers are beginning to find them open for business and courting the Emory crowd. Fab'rik has used ScoutMob coupons, arranged private shopping events for Emory sororities, and offered student discounts to lure shoppers, says store manager Ali Veremakis, who notes that many of their customers are Emory students living onsite in the development's residential apartments. To date, about 87 percent of retail space has been leased, according to Cameron Golden, of Cousins Property. Between retailers and restaurants, the initial phase of development is anticipated to create about 250 permanent jobs. "We've hired a ton of Emory students through the career center," reports Nicole Dashman, assistant store manager at Loft, which has also offered student and faculty discounts. Though parking meters are still being installed along interior streets, the parking garage is open and now available to onsite customers for a fee. While the overall complex doesn't plan one "grand opening" event, individual retailers and restaurants will be scheduling individual celebrations, Frost notes. On Dec. 8, Emory Point’s soon-to-open Bonefish Grill restaurant will team up with the University for a special preview night from 5:30 p.m. to 8 p.m. to support Emory Friends of Music (EFOM). A free dinner showcasing food and drink specialties from the Bonefish menu will be offered to the first 150 guests. Registration is required and available on a first-come, first-served basis, with a maximum of four guests. The evening will also feature a silent auction. Reservations may be made by calling 404-574-0060 or online at www.alumni.emory.edu/FOMFallDinner. In addition, Bonefish Grill has offered to donate $5,000 to EFOM to support Emory student scholarships, music lessons, the purchase and repair of musical instruments, recital accompaniment and outreach to talented young Atlanta musicians. 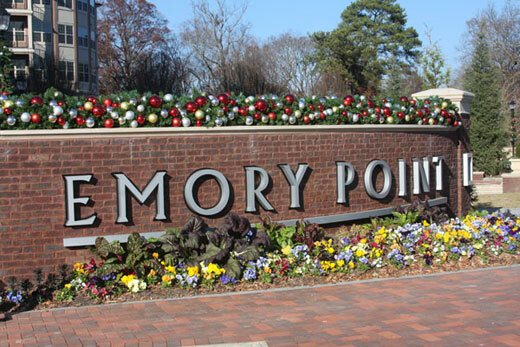 Meanwhile, construction is expected to continue into the new year on the initial phase of the Emory Point development, which will feature 80,000 square feet of retail space and 443 apartments, which are now being leased. Construction on a second phase — designed to add more apartments and retail space — is scheduled to begin in June 2013, Frost adds. “We’re excited with the reception that we’ve gotten from the general public and look forward to continuing our openings,” he says. Under Emory's land classification plan and DeKalb County zoning ordinances, 25 acres of dense woodlands directly behind the development — about half the site — will remain protected as undevelopable.